Previous Entry With only matches and a Koran, would a freezing terrorist talk? 2000 We were not broke. Republican had nothing to do with it. The Bush years never happened. It’s all Obama’s fault. Bush came into office unemployment was 4%. When he left it was 8%. And we were losing a million jobs a month. So much for tax cuts for the rich creating jobs. Bush: Came into office with a surplus. Left with a 1.2 trillion deficit. So much for the tax cuts for the rich cutting the debt. Yup. Let’s put the guys back in office that told us deficits don’t matter the surplus is bad and tax cuts for the rich create jobs. Can you explain how you are Republican after your polices bankrupted the country. Where were you when they were spending 8 trillion with nothing to show for it. Did you complain about the 800 billion in Iraq. Or did you think the Iraqi oil would pay for it. War. Iraq. 800 billion 5000 American troops killed. Libya. 1 billion No American troops killed. Since you like charts take a look at this one. Which shows the cost of Bush programs and what Obama has spent. It’s not even close. I’ll be nice. Let’s start with where you stats came from. 1. Mine came directly from Obama’s 2013 official budget and numbers used by OMB. How about yours? 2. Bush was in office for 8 years, while it looks like you’re using a graph that accounts for 2009. Strong case there… 3. Did you even read the post? If you did, you’d realize that entitlement programs—which have been in place and added to for decades—are the main drivers of our debt. Implicit in my argument is an acknowledgement that BOTH parties share culpability. One wants to drive into a wall at 100 mph, and the other at 50 mph. Should I go on? Like Maher, you appear to be such a partisan drone that your instinct is to attack instead of having rational dialogue. Although, what would I expect from someone who calls themselves “sharksbreath”, right? If you bothered to think before you went all “sharkbreath” you’d also look at 800 billion over the course of many years on Iraq vs. the long term debt that skyrockets with unfunded mandates. Obama’s 2013 budget doesn’t seriously address that, and you would have realized that it’s sadly a drop in the bucket if you took a step back and objectively looked at the numbers. Where was I in 2000? Getting out of a mechanized infantry unit. I didn’t have much time for blogging back then. I hope you’ll understand. Where was I in 2007? Working full time and going to grad school full time at night. Again, not much time for blogging. I didn’t want to end up like the Occupy Wall Street kiddies. It’s kind of weird that Bill was for Ron Paul up until recently. What Happened on StupidCrazyPolitics? Bill sold out, He was Bought by the Obama Administration to make one nice long program for his new friend Obama. This is just a theory. Bill was paid Millions by the Obama Team to do this nice political advertisement. Why not mention Whissleblowers, The New World Order, Secret Societies or How the USA will pay forever by fighting other Countries Wars forever? He Finally just gave up and SOLD OUT! No reality at all in this waste of a program. And we were stupid enough to watch it! Mr. Sharksbreath, let me help you. #1. Republicans are also guilty when it comes to running deficits, and George Bush of course signed the prescription drug benefit that added a lot of insolvency to government funded senior health care. So I agree with you in that we should not overlook Republican transgression in this area. However, Barack Obama came into office and instead of putting out the fiscal fire threw gasoline onto it (the one time he embraced a fossil fuel). National debt has gone from $10 trillion when Bush left office to $15 trillion under Obama’s treacherous reign, and I’m not even counting Obamacare, which is the dagger that will ultimately destroy our sovereignty as the U.S. Treasury gives way to foreign powers (SEE: Greece and Germany). Not too shabby if you are trying to destroy America. Blame George Bush if want to, but remember that if George got Uncle Sam drunk, Barack Obama is feeding him enough sleeping pills to kill him. Bill Clinton did NOT wipe out the national debt and replace it with a surplus. In fact he didn’t even end annual deficits, at least not by himself. No, a deadlocked Clinton and Republican Congress allowed the economy to grow sufficiently such that for a few years the annual fiscal account was in surplus (i.e., not adding to the national debt, but reducing it slightly). Make no mistake: the national debt was still massive under Clinton. Read my essay and you will learn a great deal about this. A voice of sanity rang out from the darkness. It had a name, and it was ‘sasoc’. Doug, I’m a huge fan of Bill Maher. As a follower of comedians, I completely disagree. He may not be as astute with observational humor as the brilliant George Carlin was, but each comedian has their own style and Bill’s focus is primarily focused on politicians and celebrities. He takes from the famous and infamous, as well as the current topics du jour and makes fun of them. He doesn’t just make fun of those he dislikes. He has made fun of countless people you wouldn’t expect him to dislike: The Clintons, Anthony Weiner, John Edwards, Cher and Chaz Bono, Madonna, etc. Just defending my Maher because he makes me laugh and I love the panel format of his political shows. As for your political argument with him: I think you’ve glossed over something. Maher never said the deficit hasn’t increased since Obama. Of course, it has and Maher readily admits it. 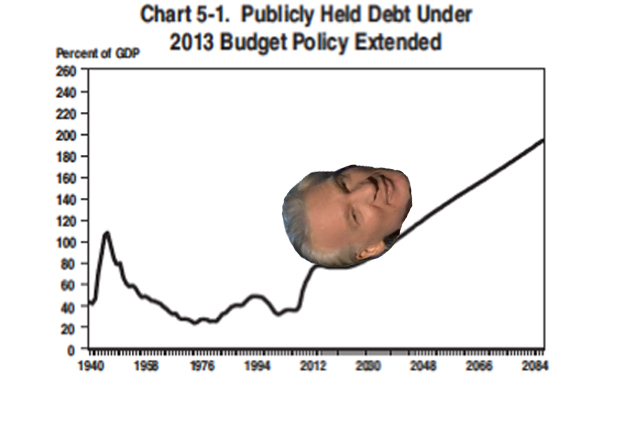 Maher’s contention is that Bush II began this insurmountable debt with wars we weren’t prepared to pay for (as we did with bonds during WWII) and our defense budget that is grossly misused. As someone who’s served, surely you can attest the military can be abused and money that can be going to help our Veterans who actually fought is continually wasted by staying overseas. We may not agree politically on some or many issues, but we do agree there is entirely too much spending on waste. As for entitlement programs, I’ve no easy answers for you. I was paralyzed at 15 due to medical malpractice. I never received one penny in recompense. I’m thankful for Medicaid for people like me. Sadly, I do know these programs are abused by many. I’ve read stories of millionaires receiving SS or people who aren’t truly disabled getting disability. I don’t know how this happens as I went to the office myself to prove I’m crippled and they follow up with me to ensure my health status hasn’t improved. Thanks for the comment. First off, let me say that Medicaid was designed to help the poor with their medical bills, and no conservative in their right mind would ever complain that you, given your condition, receiving payments. The problem comes in when the definition of “poor” is changed to include vast segments of the population that are perfectly able to take care of themselves. On Maher’s talent, we’ll have to agree to disagree. I see Maher as a somewhat witty, narcissistic bully. His humor seems fueled by anger to me, and the claps in his audience seem to come more often than not from a “Yeah! You tell em’, Bill!” reaction, than from joy. Regardless, thanks for taking the time to share your feedback. You’re an upstanding guy. I can be pretty cynical towards situations and people; especially when it comes to politics, because there is so much animosity on all sides and actually within the party. Case in point: You and I have been more civil towards one another than I think Gingrich and Romeny could be towards each other in real life and running in same race. When I saw you were a Breitbart admirer, I was a bit cautious, but I can see we all don’t necessarily fit into mold. If you misunderstood my point, I was remarking on Breitbart’s infamous demeanor in comparison to yours. I will concede with you that comedy, particularly stand-up comedy, is often fueled by anger. There are exceptions like Ellen DeGeneres, but most of the acts I’ve seen are usually people trying to contend with as well as vent their grievances through humor. Thanks for the comment. When someone comments on my blog civilly, I will always try my best to respond in kind. When they don’t, I’ll usually zing them and move on. I’ve found that arguing with professional idiots is a losing proposition, since they have more practice it at. Even though I disagree with Ellen’s politics, she seems like a nice lady. I’m sure I’ll write on someone else’s comedy routine in the future, and hopefully you’ll find your way here to respond. This blog is garbage, just another name dropping nobody. How long did it take you to come up with that one, anonymous? You’re a genius.